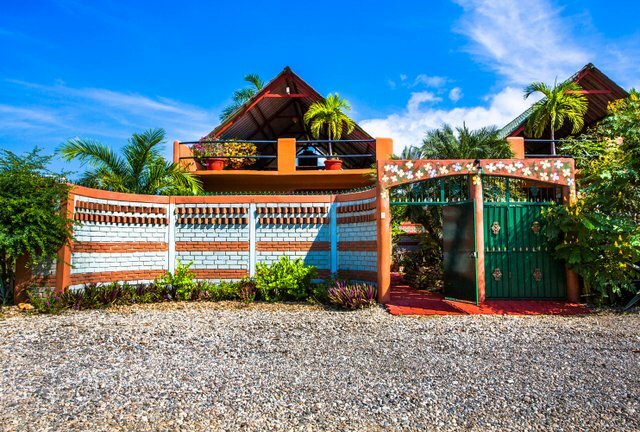 The Twin Cottages, located near the Rinconada area of Puerto Escondido, are conveniently situated close to Puerto Angelito and Carrizalillo Beaches and to boutiques, a well-stocked convenience store, Internet centers, charming restaurants and the International Friends of Puerto Escondido library. 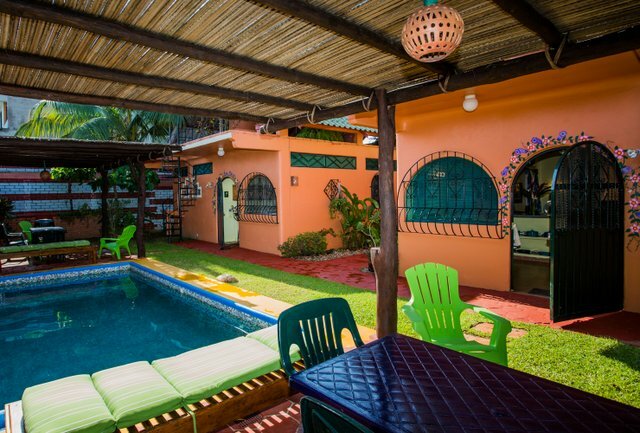 The cottages, Verde and Azul, are nearly mirror images of one another. Totally wheelchair accessible on the main floor, each has wireless internet, a fully equipped kitchen, a roomy bathroom with two separate sinks and safety bars, and a room that doubles as a dressing room/office with a built-in desk, dresser and closets. A comfortable breakfast bar with two stools separates the kitchen from the seating and sleeping areas. There is one queen sized bed and one double bed, both with high quality mattresses. Each studio style housekeeping cottage has its own front porch, sheltered patio and barbeque. Circular stairs at each cottage take guests to a spacious covered A-framed roof space where a picnic table, lounge chairs and a hammock await vacationers. The rooftop affords a beautiful panorama of the Pacific Ocean with fiery sunsets in the afternoon. A swimming pool shared by the cottages is partially covered at both ends to offer shaded dipping. The cottages are "green." They are cleaned once a week, at which time towels and linens will be changed. Vacuum cleaners and brooms are handy for mid-week clean-up. An ample initial supply of toilet paper will be available, as well as dishwashing detergent and hand soap. Two large water bottles of purified water are supplied at the beginning of each stay. Flower-filled gardens, grassy areas, roof-top planters and tropical trees are cared for by a gardener. Our renters are one or two responsible, mature adults who will respect the Twin Cottages and its property and care for it as if it were their own. Smoking is only permitted in outdoor areas. The cottages are equipped with c.d. player/radios, but if both cottages are occupied, each side must remember to keep the volume of the sound systems at a level which won't interfere with their neighbors' space. Considerate guests are welcome to visit, of course, but not to spend the night. We cannot accept pets larger than goldfish. We're happy to answer any questions you might have. We welcome visitors who plan to spend at least one week. Rental rates decrease with longer stays. A 50% non-refundable refund is required to hold your reservation. Thanks for considering the Twin Cottages.